Mafia 3 will cast you as Lincoln Clay, a gangster in 1968 New Orleans seeking revenge for a mob attack on his family. Clay is a Vietnam veteran with a violent streak, and you can exercise that freely in an open world city ruled by opposing gangs. As with previous Mafia games, the city serves as a backdrop to a tight linear story that sees Clay attacking gangster hideouts to work his way up to the big boss. 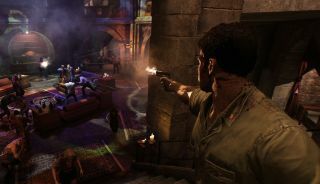 As you take over new properties, you can hand them off to your gangland pals, including Vito from Mafia 2 Our friends at GamesRadar have seen it, and praise its ambiance and use of late '60s pop culture—expect classics from Hendrix and The Rolling Stones as you cruise around New Orleans' bustling streets. It's remarkably violent, too. Clay can smash opponents with third-person takedowns and clear rooms with a huge revolver. Enemy gang members can be captured, interrogated and then killed or spared depending on your mood. Your decisions will supposedly be reflected by the changing city as the story progresses. We'll know more as 2K drip-drop information over the course of Gamescom. For now here are a few screenshots showing off the city. What an exciting time and place to set a game.